The Premier Inn Cardiff South is situated next to the Ocean Park Brewers Fayre pub/restaurant, just off the magic roundabout. 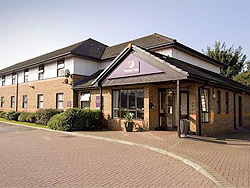 Premier Inn is the UK's biggest hotel chain and offers great value, clean and comfortable accommodation. This hotel also provides free on-site car parking for guests. Brewers Fayre pub/restaurant next door. Guest rooms feature comfy beds, en suite bathroom, satellite TV and a telephone/modem point. Good value accommodation near to Cardiff city centre.